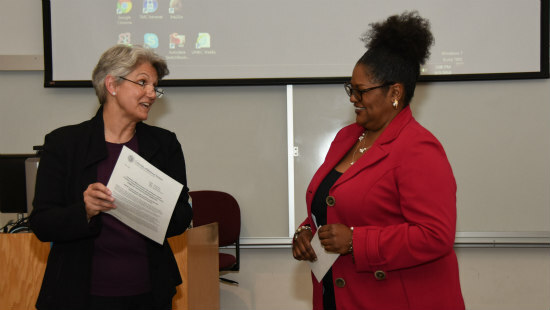 Interim Chancellor Barbara Bichelmeyer (left) presented the University of Missouri System President’s Award to Jannette Berkley-Patton, associate professor in the Department of Biomedical and Health informatics. Interim Chancellor Barbara A. Bichelmeyer recently recognized Jannette Berkley-Patton, Ph.D., associate professor in the Department of Biomedical and Health informatics, with the University of Missouri System President’s Award on behalf of University of Missouri System President Mun Choi. Berkley-Patton received the President’s Award for Cross Cultural Engagement. It recognizes faculty who demonstrate success in promoting cross-cultural activities or understanding through classroom or student service activities, or through direct service to global or regional efforts that relate back to the university. The majority of Berkley-Patton’s research funding supports her faith-based and health community partners with staff, equipment and training to improve the community’s capacity to address health. Berkley-Patton values collaborations within the community and has been a leader in researching community-based health interventions to reduce HIV, diabetes, heart disease and mental health disparities among the African-American community. The UM System President’s Awards are presented annually to faculty members across the four campuses of the UM System who have made exceptional contributions in advancing the mission of the university. Berkley-Patton will be formally recognized by UM System President Choi during an awards celebration in June. 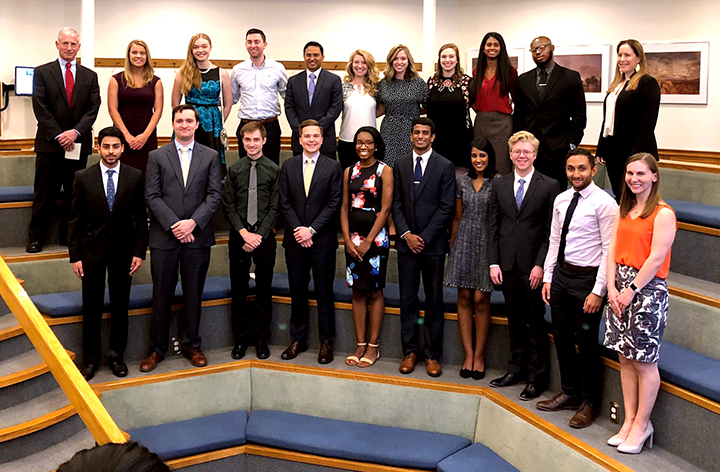 Two of the School of Medicine’s May graduates, Ravali Gummi and David Sanborn, have been selected as UMKC Vice Chancellor’s Honor Recipients. Staff member Jennifer Tufts, academic advisor in the Department of Biomedical and Health Informatics, also received the honor. The Vice Chancellor for Student Affairs and Enrollment Management takes nominations from each academic unit to recognize graduating students who have excelled in academic achievement, leadership and service to UMKC and the community. Gummi was nominated by her faculty mentor, Peter Koulen, Ph.D., director of basic research at the school’s Vision Research Center. Gummi gave a presentation on the Kansas City Free Eye Clinic and was invited to speak during the opening ceremony of this year’s Clinton Global Initiative. Sanborn, who has served on the school’s Council on Evaluation and Coordinating Committee, was nominated by his docent, Fariha Shaffi, M.D. He is a member of the Gold Humanism Society and the Alpha Omega Alpha medical honor society. Sanborn also led an independent student analysis in preparation for the school’s recent evaluation visit by the Liaison Committee on Medical Education. Tufts is completing a Master’s of Arts degree through the School of Liberal Arts with a focus on public history and urban planning. While studying for her degree and working, she has served as president of her local community organization for the past two years. Tufts was nominated by her faculty mentor Sandra Enriquez, Ph.D., a professor of history. 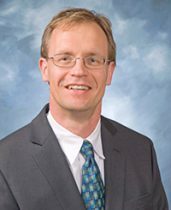 The Association for Research in Vision and Ophthalmology has recognized Peter Koulen, Ph.D., director of basic research at the School of Medicine’s Vision Research Center, as a member of is 2018 Fellows Class. 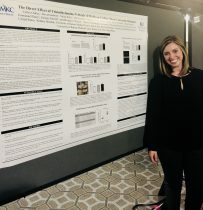 Koulen received the honor and was invited to give a research presentation during the organization’s annual meetings April 29-May 3 in Hawaii. The fellowship recognition acknowledges the accomplishments, leadership and contributions of association members. ARVO Fellows are role models and mentors for scientists pursuing careers in vision research and ophthalmology. ARVO is a world-wide organization of nearly 12,000 researchers from more than 75 countries. It serves to promote and enhance the understanding of the visual system and the prevention, treatment and curing of its disorders. It is also a leading international forum for the advancement of basic and clinical knowledge among vision researchers. Koulen serves as the Felix and Carmen Sabates-Missouri Endowed Chair in Vision Research. His studies focus on basic research and therapy development for chronic diseases of the eye and brain. 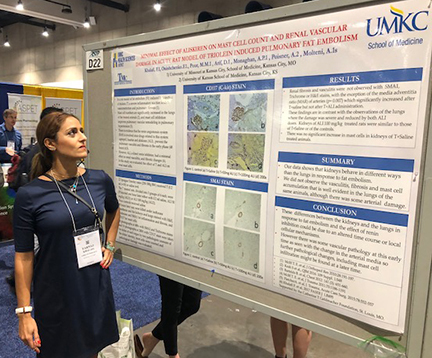 Farnaz Khalafi, M.D., pathology resident, presented a research posted during a special session of the 2018 Experimental Biology conference. 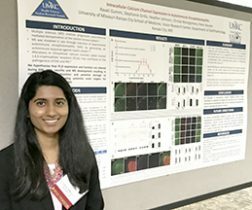 Third-year pathology resident Farnaz Khalafi, M.D., presented a research poster at a special session of the 2018 Experimental Biology conference that took place in San Diego. Khalafi’s poster was one of the top 20 posters selected from more than 200 submitted to the American Society for Investigative Pathology for presentation during a session on Next Generation Scientists: New Discoveries of Graduate Students and Post-Doctoral Fellows and Rising Stars. 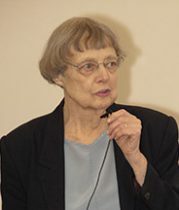 She is the first-author of “Minimal effect of Aliskiren on mast cells count and renal vascular damage in acute rat model of Triolein induced pulmonary fat embolism.” Co-authors include Elizabeth Onishchenko, Mohammad Pour, Dauod Arif, Paula Monaghan, Alan Poisner and Agostino Molteni. 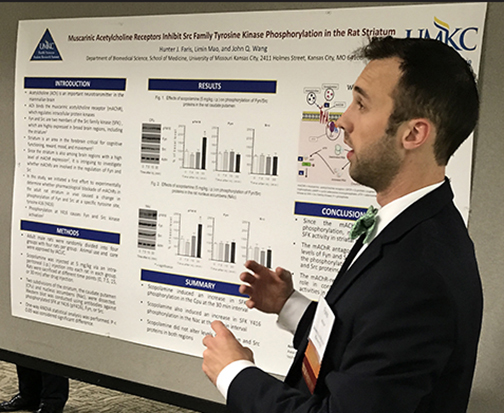 Six medical students from the School of Medicine are co-authors of research abstracts or posters accepted for presentation at the conference. The students include Ariana Fotouhi, Thomas Haferkamp and Taylor Lind, Elizabeth Onishchenko, Abigail Spaedy and Michael Van Dillen. Experimental Biology is an annual invitation-only meeting of five scientific societies made up of more than 14,000 scientists who focus on anatomy, biochemistry and molecular biology, investigative pathology, pharmacology, and physiology. UMKC School of Medicine students (left to right) Saber Khan, Becky Kurian, Yicheng Bao, Creighton University pharmacy students Caressa Trueman and Amy Cimperman, and UMKC med student Diana Jung combined to win an interprofessional education reasoning regional competition at Creighton University in Omaha, Nebraska. A team students from the UMKC School of Medicine showed its mettle in winning an interprofessional education reasoning competition at Creighton University on March 24 in Omaha, Nebraska. 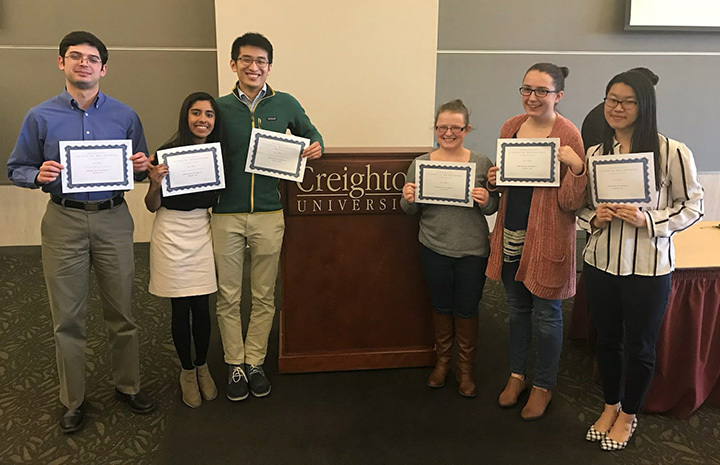 Fourth-year students Diana Jung and Saber Khan, and third-year students Yicheng Bao and Becky Kurian teamed with Creighton pharmacy students Amy Cimperman and Caressa Trueman to present the winning case in the 2018 Regional Interdisciplinary Clinical Reasoning Competition. Teams were comprised of a mix of medical, pharmacy and nurse practitioner students. 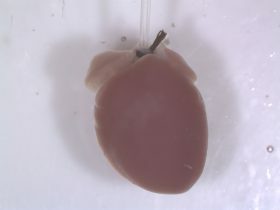 Each team was presented a patient case, similar to a real-life encounter. They then had two and a half hours to evaluate the chief complaint and medication list, make a working diagnosis, and order needed lab tests and treatments. Teams that advanced to the final round then presented their case to a panel of judges to defend their reasoning and gain feedback. The UMKC team ranked first among four competing schools in team work and collaboration, concise and professional presentation, and demonstration of appropriate clinical judgement and management. Jung said the experience drove home the need for teamwork among health care providers in giving patient care. 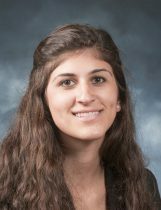 Sixth-year medical student Caroline Baghdikian has been selected as a UMKC Vice Chancellor’s Honor Recipient for the 2017 fall semester. The vice chancellor for student affairs and enrollment management takes nominations for the honor from each academic unit to recognize graduating students who have excelled in academic achievement, leadership and service to UMKC and the community. Baghdikian was nominated by School of Medicine Education Team Coordinator Brent McCoy. Robynn Shines, a student in the School of Nursing and Health Studies working in the Department of Biomedical and Health Informatics’ community health lab, is also among the recipients. Recipients are invited to attend an annual awards breakfast to celebrate their achievements. This year’s breakfast will take place on Dec. 15 at the Student Union.